B.V. Spitsyn is Russian scientist who with B.V. Deryagein in Institute for Physical Chemistry in Moscow pioneered the research in CVD diamond synthesis making the first CVD diamond in 1956. 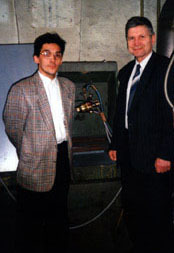 The existing equipment enables R&D in the area of CVD, and this is one of the most important activities of Plasma Jet. 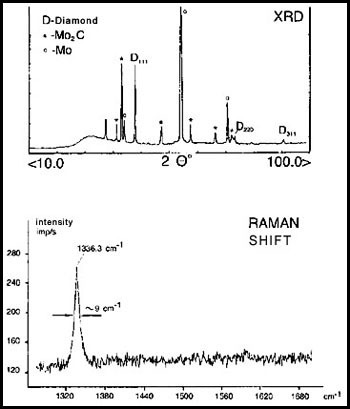 The CVD synthesis of diamond layers from methane, using the DC plasma jet method is the process currently on a laboratory level. This method enables the synthesis of a diamond film of unlimited thicknes applied to very large areas. The DC plasma jet technology produces a diamond deposit of exceptional purity and greatest deposition rate compared to other existing CVD methods. The picture shows a CVD diamond layer synthesized by Miroljub Vilotijevic. The application of CVD diamonds is based on the exceptional hardness of diamond (8,000-10,000 HV). However, another exceptional combination of characteristics - excellent electrical isolation with the best heat conductivity of all the materials (highest quality natural diamonds have the conductivity of 2000 W/mK which is 5 times that of copper), makes them exceptionally interesting for applications in electronics, in the production of high power IC because of the quick dissipation of generated heat. Reducing the cost of the DC arc jet method of diamond deposition. Performing diamond deposition of any thickness on any surface size using the CVD method. Synthesizing diamonds of geometrical structure and quality not found in nature. Reducing the cost of diamond deposition using the DC arc jet method is only possible if 100% re-circulation of mixed gases (methane, argon, and hydrogen) can be achieved. With recirculation of mixed gases, only methane gas is consumed in the process of diamond synthesis by Chemical Vapor Deposition (CVD). This is a crucial factor in reducing the cost of diamond deposition with the CVD method. Calculations show that under normal conditions of installation (2 X 200 kW minimum), very large amounts of argon and hydrogen would be required. However, diamond deposition using the CVD method with the same power and 100% recirculation of mixed gases would reduce the cost of production such that it would be close to the price of production of industrial diamonds using the commercial technique of High Pressure High Temperature (HPHT). Diamond crystals produced using the HPHT method are very fine. 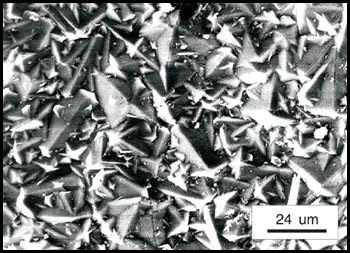 Diamond crystals produced using the CVD method may be of geometric structure and quality not found in nature, and may be deposited in plates of any thickness and surface size. The problem with 100% recirculation of gas mixture in the DC arc jet method is the high reactivity of the W-cathode. A great deal of work has been done to resolve this problem. We now have a solution to this problem.